With the immediate threat of a possible post office closing in recent days, it’s hard to remember that a week or so ago the biggest concern downtown was the rising river. We’re not out of the woods (or, more accurately, the waters) yet, and the NDDC has been pitching in on the preparations. The City of Northfield had announced that assisting private parties with property protection in non-emergency situations is #6 on a list of 9 items in its Emergency Protocol for flooding. In response, the NDDC staff posted background information and met with a number of building and business owners who had suffered greatly during the most recent flood to learn of their preparations. We found that property owners had been researching strategies and tactics from flood-threatened communities along the Red and Minnesota Rivers. In fact, informally led by Kurt Larson of Larson’s Printing, they’d come together with a plan (and materials) to prepare and store sandbags. They said that they could use some help implementing their plan. When NDDC President (and St. Olaf College Dean of Students) Greg Kneser heard of this need, he offered to send the word out to St. Olaf College students. 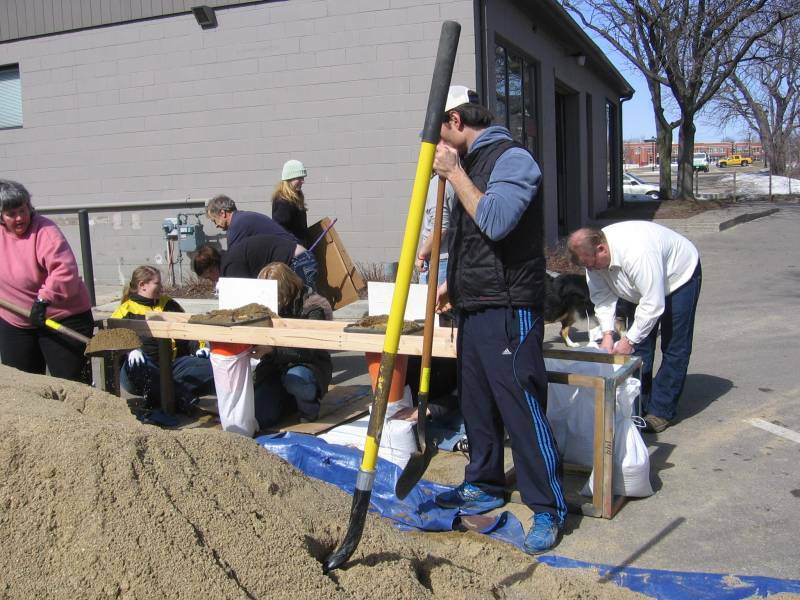 On Friday, March 18th, the Oles descended on the west side of the river and filled and hauled sandbags with the building owners. Greg can be seen tying off a bag at the right. Hopefully, the cool, dry weather will last long enough to avoid another flood. If not, thanks, in part, to Greg and his Oles, the Westsiders are a little more prepared.